A new world record is ours! We've done it! The Touareg Cape to Cape 2.0 Challenge is complete, and Rainer Zeitlow, Marius Biela and Sam Roach are now World Record holders. Our arrival in the the Northernmost point of Norway, Norkapp at 14:00 today (Sunday) marked the end of the gruelling 19,000km route across 21 countries completed in just 9 days, 4 hours and 8 minutes. Given that our own target was to record a time of under 10 days, to come in 20 hours earlier than that is beyond all of our expectations. We are overjoyed to have completed the Cape to Cape 2.0 Challenge without any problems in such a spectacular time. All three of us are now pretty tired, a little achy and in need of a hot shower and good night's sleep (in an actual bed) after our non-stop 24 hour driving for the last 9 days – but we're thrilled with our achievement, and buzzing with the memories of the last 9 days. The Touareg V6 TDI has been the perfect companion for our trip: spacious enough for the three of us and all of our camera gear, plus our extra fuel tanks and spare wheels, but also delivering more than enough power from the TDI V6 engine to keep our average speeds so consistent throughout the drive. But above all, it is the sheer ruggedness of the Touareg that has impressed us all most over 19,000km of some of the worst roads on the planet. So this is our moment to again thank each and every one of our sponsors, and extend our extra special thanks to Volkswagen Bratislava, HP and Intel as our primary partners. Firstly we must mention Borbet and Goodyear for their exceptional rims and tyres, free from any damage or punctures in the most brutal of road conditions. Intel, HP and Inmarsat together provided us with 100% reliable in-car communications solutions in even the remotest parts of our route, and effectively turned the Touareg into a rolling innovation centre allowing us to keep in touch with the outside world 24/7. HBM and IAV's advanced automotive sensors worked seamlessly with this connectivity to provide valuable data logging of the Touareg and the team throughout the challenge. Exide Batteries helped to keep up with the significant power demands of all of these on board electronic systems. 3M protected the Touareg with their Scotchgard covering on all of the front panels to save the paintwork from the stone and debris damage which is always one of the risks of a World Record drive. Getac's navigation tablet provided the essential navigation services faultlessly at every stage of the route, clearly readable even in the brightest sunshine, meaning that not once did we miss a turn or get lost. Glysantin's engine cooling liquid helped us to cross areas as hot as the Sahara desert at sustained high speed without the engine temperature once varying from where it should sit. Without every one of these partners, there would possibly be no new World Record today. Finally for now, a huge thanks to all of the supporters, fans, fixers, Volkswagen organisations and new friends that we have met along the route across the world, and those supporting us back at home, all of whom have really helped make a contribution to our success. Way too many to mention here but you all know who you are. A final quote from the man behind the Cape to Cape 2.0 Challenge, Rainer Zeitlow as we crossed the finish line in Nordkapp: "We are happy that we can now end our Cape to Cape project with this amazing time of 9 days, 4 hours. This feeling makes up for the disappointment of 2014's delays which meant we couldn't set a competitive time. I am also very proud that our route took us on the maximum possible driving distance, keeping our permitted flight over Syria to the absolute minimum possible distance. That's really important for me to know that we completed every possible km driving on the ground. Finally, please let me give my enormous thanks to all of my sponsors and partners again, plus all of the many people and organisations who have provided me and the team with their support behind the scenes across the Cape to Cape route." So, that's the final blog from the team of three in the Touareg. We hope that you've enjoyed the wonderful photography and videos from Marius throughout the route, and that our blog updates have given you a feeling for the experiences we've been having along the way. Now, the three of us have finished; it is time for us to head off to a nearby hotel, get a hot shower, a quick bite to eat before beginning the job of catching up on our sleep. 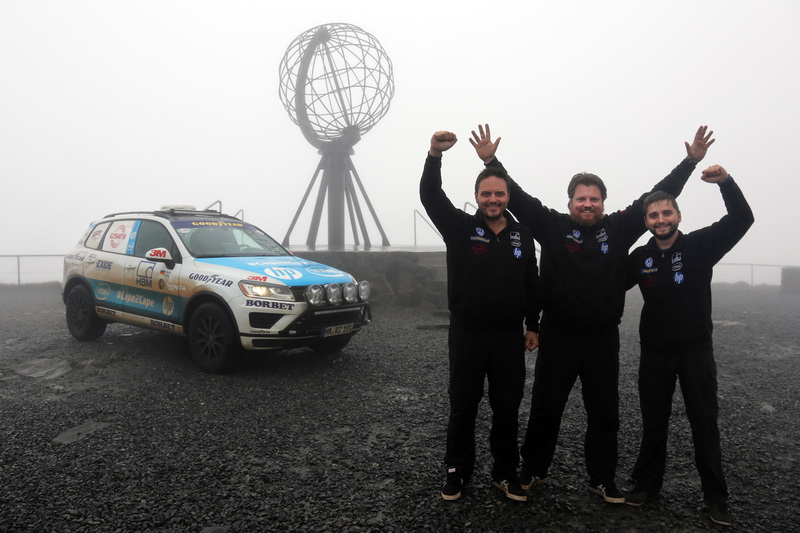 Our arrival in the the Northernmost point of Norway, Norkapp at 14:00 today (Sunday) marked the end of the gruelling 19,000km route across 21 countries completed in just 9 days, 4 hours and 8 minutes. Given that our own target was to record a time of under 10 days, to come in 20 hours earlier than that is beyond all of our expectations. Kristina Hansen, Mayor of Nordkapp, was waiting for us at the Cape and stamped and signed our official World Record papers, and with that the record becomes official. 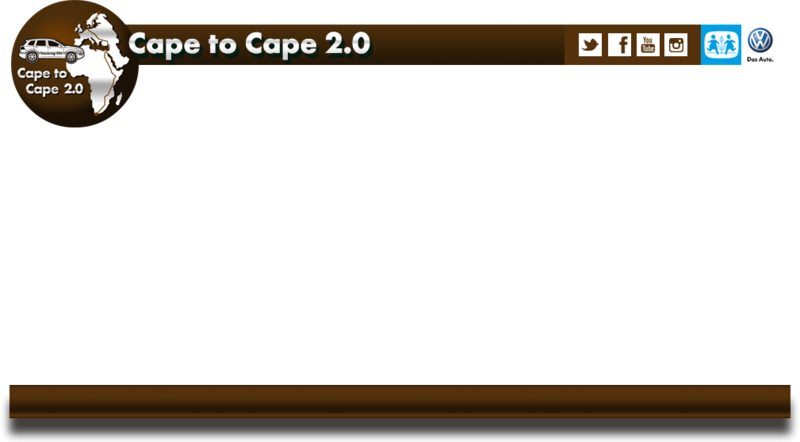 We are overjoyed to have completed the Cape to Cape 2.0 Challenge without any problems in such a spectacular time. All three of us are now pretty tired, a little achy and in need of a hot shower and good night's sleep (in an actual bed) after our non-stop 24 hour driving for the last 9 days - but we're thrilled with our achievement, and buzzing with the memories of the last 9 days.